Oakville, ON, December 2, 2015 – In a fortuitous coincidence, Members of The Oakville, Milton and District Real Estate Board (OMDREB) held their annual Election/Christmas Luncheon on #GivingTuesday. It was at this time last year that 2015 Board President, Jeff Mahannah announced that he had chosen the Nanny Angel Network (NAN) as his President’s Charity. NAN is the only organization of its kind in Canada to provide free in-home childcare support for mothers who have been diagnosed with cancer, for those requiring palliative care and for families requiring additional relief during the bereavement period. 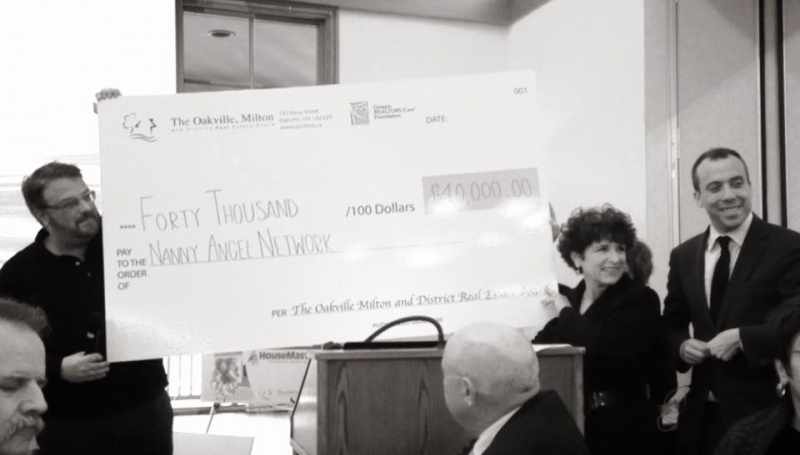 In the last 12 months, Members of OMDREB threw their support behind the charity and on #GivingTuesday, they were able to present Audrey Guth, founder of the Nanny Angel Network (NAN) with a $40,000 contribution, representing funds raised throughout 2015. Incoming President, Charlotte Forget, used the event to announce the Nanny Angel Network as her charity of choice for 2016. “Since OMDREB has also given NAN office space at its 125 Navy St. location in Oakville, it makes perfect sense to continue to help them establish their burgeoning Halton chapter,” Forget said. But it didn’t stop there. Through 2015 contributions to the Ontario REALTORS Care® Foundation, OMDREB was able to present cheques for $5,000 each to three other local charities. On hand to receive the contributions were: Britta Martini-Miles, Executive Director of the Lighthouse Program for Grieving Children; Sandy Bartel, Fund Development and Partner Manager for Habitat for Humanity Halton Mississauga; and Donna Danielli, Executive Director of Milton Transitional Housing. And, in keeping with the tradition of bringing donations of food to celebrate the spirit of the season, OMDREB members also contributed both food and funds for Food4Kids North Halton. Manager Leslie Salisbury was present to fill her vehicle with the contributions from local REALTORS®. OMDREB REALTORS® truly demonstrated they have embraced #GivingTuesday!